Injecting colour for a different look each season is a great way to give yourself a boost and feel great, especially in the colder autumnal months. This isn’t so easy if you use chemical-based hair colour. Each time you colour your hair it strips it of all the natural oils and leaves it dry and frizzy. But there is a natural alternative – Herbal Hair Colours from Khadi are created using pure Indian herbs formulated to Ayurvedic principles. These unique products are kind to your hair; the colour wraps around each strand to give all over natural colour, even on greys. As Khadi hair colours do not contain any peroxide, ammonia or artificial dyes, they are gentle on your hair and scalp while naturally conditioning to give healthy hair. Auburn locks are always the most popular look come autumn. Adding orange and red tones to your hair brings warmth and livens up your hair. Khadi Herbal Hair Colour with henna, amla and jatropha will turn light hair orange and red, and dark hair an intense mahogany. The addition of amla and jatropha gives the hair a darker colour than just henna on its own for dramatic and lasting results. Henna is ideal for developing a rich, deep colour that will leave hair glimmering. The most dramatic of these colours is the Khadi Herbal Hair Colour in blue black. This henna gives the hair an air of indigo and turns dark hair into a shimmering mass of blacks, blues and dark purples. If you are after a more subtle look then henna can help gloss the hair for shine and a healthy shine. 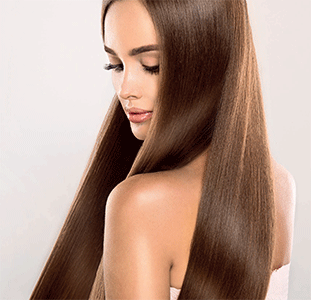 Brunettes can use Khadi Herbal Hair Colour in natural hazel to add a rich gloss without any red tones. Use a shade similar to your own and think of it as the ultimate conditioner. Your hair will feel thicker and will be gleaming with health. Of course, once you’ve achieved your desired shade, the best way to maintain it is with a natural shampoo and conditioner such as the Lavera Colour and Shine Shampoo. It is ideal for helping maintain colour treated hair, added shine and keeping it in perfect condition and retaining those new hues for longer. And if your hair needs a boost in between colours, try Fair Squared Coconut Hair Oil. It contains fair-trade coconut oil, vitamin E, soy and argan oil to restore moisture and keep those tresses soft and manageable. Colouring your hair with Khadi Herbal Hair Colours is so easy to do at home. 1. Apply to dry, unwashed hair. 2. Apply cotton wool to hairline to avoid colour leaking onto skin. 3. Put the Khadi Powder into a bowl and mix to a thick paste with warm water. Mix for 3 minutes. 4. Apply generously to the full length of hair. 5. Use a plastic wrap, shower cap and a dark coloured towel to retain warmth. 6. Leave on for 30 minutes to two hours depending on desired colour. 7. Fully wash out with warm water. 8. For best results shampoo after 48 hours. A strand/patch test is required before application to determine suitable shade and time length to leave the colour on the hair for. Comprehensive instructions are included with each purchase.